For the record, I am not skinny, nor am I a girl, but I do know quite a few. More importantly I know of many women that struggle every day to maintain a self-esteem-pleasing body weight while being able to enjoy many of lifes little pleasures. Case in point: Margaritas. Over the course of my professional drinking career I could probably count the number of patrons that don’t like margaritas on my hands. Even those that aren’t fans of tequila will manage to throw back a few margaritas from time to time because it’s ingredients mix well deliciously. But with the margarita becoming a casual cocktail served in just about any restaurant you can find, companies and bars are moving away from the quality margarita we once had that included natural ingredients and instead have replaced them with excess sugar, sweeteners, and more importantly calories. Insert Skinny Girl Margarita, “the margarita you can trust”. Skinny girl is the brainchild of natural ingredient chef, author, and TV personality of “Housewives” fame, Bethenny Frankel. After being repetitively asked about my opinion on this cocktail, it’s pre-made version, and about the ingredients it includes I decided it was time to give it a try. For review purposes I’ll cover both the “ready to drink” version you can find in several package stores around the country, and it’s predecessor “from-scratch” version created by Bethenny. For the record I am not a fan of “ready to drink” products due to there tendency to be inconsistent in taste with that of the real drink. But pre mixes aren’t all bad when done correctly, and hopefully “done right” will be the case with Skinny girl today. Skinny Girl (From Scratch) – The recipe is simple, 2 oz of premium tequila, the juice of about four lime wedges, and a splash ( only a splash !) of your favorite triple sec. In all actuality the “Skinny” recipe is more like the “original” recipe. 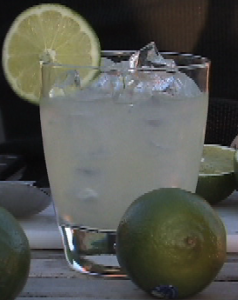 The margarita is a fairly simple recipe to begin with. Despite its simplicity, bartenders and corporations continue to ruin it with their sugary filled remixes to the age old classic. That being said for my margarita I chose Milagro Silver tequila, and Grand Marnier. Those combined with the lime juice, about 1 tablespoon, gave me a delicious “skinny girl” margarita. This is both refreshing and authentic in taste to the original margarita. Optionally, Bethenny mentions that as a cheat method she adds in a splash of sugar free lemonade as well. With or without it, this is an exceptional guilt free margarita reminding me of margaritas of yesteryear. Skinny Girl (RTD) – Let me first say that right off the bat this product is a triple threat in my opinion. This product keeps in mind the consumer on a diet (natural agave sweetener), the consumer on a budget (retails at about 12.99), and the consumer on a time constraint (it is after all ready to drink). That alone makes this very tempting to many “housewives” across America. But how does it stack up against other ready to drink cocktails and those that are made from scratch? When cracking this one open, the first thing you get is a strong sense of the tequila smell. The interesting thing though is the drink doesn’t have much of a tequila taste, both good and bad depending on who is drinking it I guess. When comparing it to the original it is definitely sweeter, something you should expect from any pre made cocktail, but in comparison to the usual Jose Cuervo, 1800, or other similar RTD margaritas it is definitely lighter in comparison in sweetness. The sugar doesn’t overwhelm you like we have seen in so many other similar products. Oh and did I neglect to mention that this cocktail is only 100 calories? Consider that the average margarita you order in a restaurant these days can have anywhere from 300 to 1000 calories, and then realize this is a miracle in a bottle. All in all this is a better-than-most pre made margarita that is both light and tasty. I don’t expect to see many men ordering these up at the bar, or walking out of the package store with a bottle of this anytime soon. But for the ladies, this is perfect for your next “girls night out”… or in. Drink responsibly. Nice writtings there keep it up.